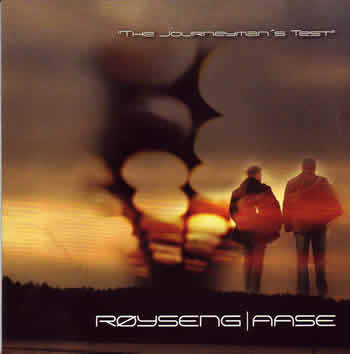 The Classical Free-Reed, Inc. CD Review Røyseng and Aase: "The Journeyman's Test"
CD Review: Røyseng and Aase: "The Journeyman's Test"
"Røyseng/Aase have toured large parts of Norway, and have amongst other things, held over 300 school concerts for the Norwegian 'Rikskonsertene'. The duo has also held concerts in Bulgaria, Iceland, Italy, Sweden, the Czech republic and Germany. Back home in Norway, they have created well known names for themselves through the many concerts and performances that they have held throughout the years." Which is to say, this duo has played together long enough to sound like one instrument. It has been said that when two people are together for an extended period of time, they begin to think alike and to anticipate each others thoughts and moves. This is true for Duo Jupiter. "The Journeyman's Test" is a delight to hear. This CD demonstates both the extent of their repertoire and their skill as a duet. The opening track starts with a BANG!. "The Journeyman's Test" has a fast paced motif with accompanying bellow shakes that creates a drive that is sustained to the last note. Indeed, they pass the test. "Mischievous Tunes" is a delightfully fanciful piece that plays with various styles of dance. Duo Jupiter effortlessy morph from one style to another and back again. Showing that the accordion can effectively (and affectively) handle all styles, the duo provide us with their arrangement of Grieg's From Holberg's Time Op. 40. As to be expected, this classical piece demands sensitivity, technical prowess, and balance. All three are present. Tracks 6 through 9 bring us back to the folk roots of the instrument presenting dances cast is a virtuoso mode. The most playful piece on the CD, Dance of the Grasshoppers, is followed by the prestissimo Moldavian Dance. Each of these tracks communicate an infectious energy. Duo Jupiter takes us to the Baroque era with Concerto, Op. 3, No.8. The performance is so integrated that the two sound like one organ. The album ends by taking us back to the twentieth century. "Close your eyes and listen" is both the title of Piazzolla's piece as well as sound advice (pardon the pun). Piazzolla always demands the most of the performers' expressive capabilites. This pensive piece is no exception to the rule and Duo Jupiter proves that they can pass this journeyman's test too. We end our time with Røyseng and Aase listening to "The Sound of Saratov"--a lighthearted piece that provides a counterpart to the introspective piece that precedes it. All is all, Duo Jupiter does a journeymen's job with this CD. The wide scope of their selections and their grace and power has made this one of my favorite albums. I must say that I envy Norway for having such a great accordion duo!